Venice is one of the most beautiful and popular cities in Italy. The city can be quite expensive to visit, and accommodation is no exception. There aren't many hostels in the area, so bed and breakfasts offer the best option for independent travelers on a budget. The hostels in the area are mostly located near the train station on the mainland. 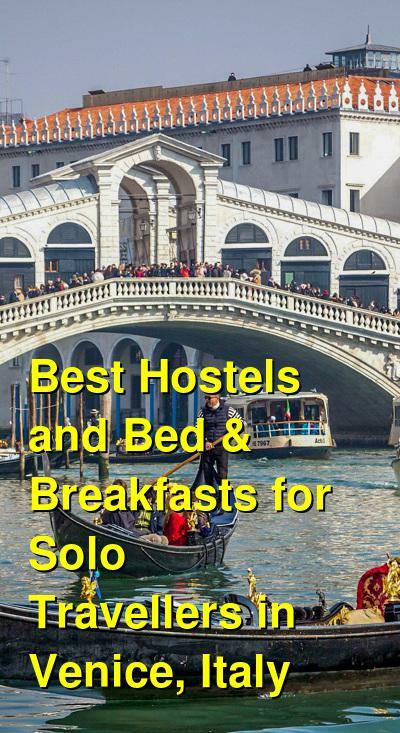 How much do hostels in Venice cost? Locanda SS. Giovanni e Paolo is a nice bed and breakfast in the historical center of the city. It's conveniently located near the Rialto Bridge and Saint Mark's Square. The atmosphere is friendly and welcoming and it's a great place to base yourself during your time in Venice. The actual building dates back to the 18th century and has been nicely renovated. The rooms are decorated with a 1700's Venetian style and offer air conditioning, a telephone, a safe, and a modern bathroom. The triple and quad rooms, which are the most affordable option, are located in the annex. They offer only the most basic amenities, but they are a good option for travelers on a tight budget. For guests not staying in the most basic rooms, there is a nice breakfast included in the price of your room. This includes croissants, bread, jam, juice, tea, and coffee. This is a pleasant place to stay that offers a range of styles depending on your travel budget. It is a great option for solo travelers as it's possible to get a decent room in a great location at a reasonable price. Casa in Laguna is a bed and breakfast that is located in a more authentic part of Venice. It is surrounded by a unique area where locals live, an area that most tourists never venture. It's not far from Campo SS. Giovanni e Paolo, where the largest church in Venice is located. 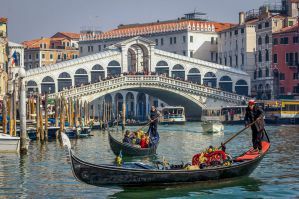 It's also just a short walk from St. Mark's Square and the Rialto Bridge. It's near the Fondamente Nove boat stop, which has boats departing to Murano, Burano, Torcello and the Lido. The rooms range in style from standard to superior. All rooms have attached bathrooms and superior rooms have balconies that look out on the canal. There is a light breakfast included in the price of the room, and guests have access to a very basic kitchen. The staff is friendly and can help you with any travel questions you might have. B&B Al Saor is a family run bed and breakfast that has a friendly and quaint atmosphere. It's located in the heart of the city near the Rialto Bridge and St. Mark's Square. It's housed in a Venetian house that has been restored and is well decorated with local art. The rooms are nice and air conditioned with comfortable furnishing. More deluxe rooms have full kitchens where guests can cook their own meals. Most rooms also have attached bathrooms that are clean and nice. There is a nice breakfast served every morning on the terrace between the hours of 8:30 and 10am. This is a great opportunity to meet other guests. It's also a great area to relax with a good book and soak up the atmosphere. This is a wonderful place to stay in a great part of the city. It truly takes full advantage of Venice's unique atmosphere. Ca' dei Fuseri Bed and Breakfast is in a very convenient part of Venice. It's about a minute's walk from San Luca Square and very close to San Mark's Square and Rialto Bridge. It's a relatively quiet place to stay despite its location at one of the most active parts of the city. The atmosphere is warm and welcoming and the staff is very friendly. It doesn't have the social atmosphere of a hostel, so it can be difficult to meet other guests, but it is a clean place to stay that is a good value for the money. The bed and breakfast is located on the third floor of a recently refurbished Venetian palace. There's also a rooftop terrace that is a wonderful place to relax and look out on the Venetian rooftops. The b&b has a cozy environment and you really will feel like you're in Venice during your time here. Private standard, deluxe, and superior rooms are available so there is some flexibility depending on your budget and travel style.